It’s been 45 years since Raoul Duke travelled across America with his attorney to cover a Las Vegas motorcycle race, only to lose himself in a drug-crazed miasma of trashed hotel rooms and a savage journey into the heart of the American Dream. Hunter S. Thompson’s seminal work came complete with illustrations by British artist Ralph Steadman, whose monstrous caricatures, spattered with psychedelic splotches of ink, added a surreal element to the book. Since then, we’ve had two film adaptations, including an indelible interpretation by Johnny Depp and Terry Gilliam. 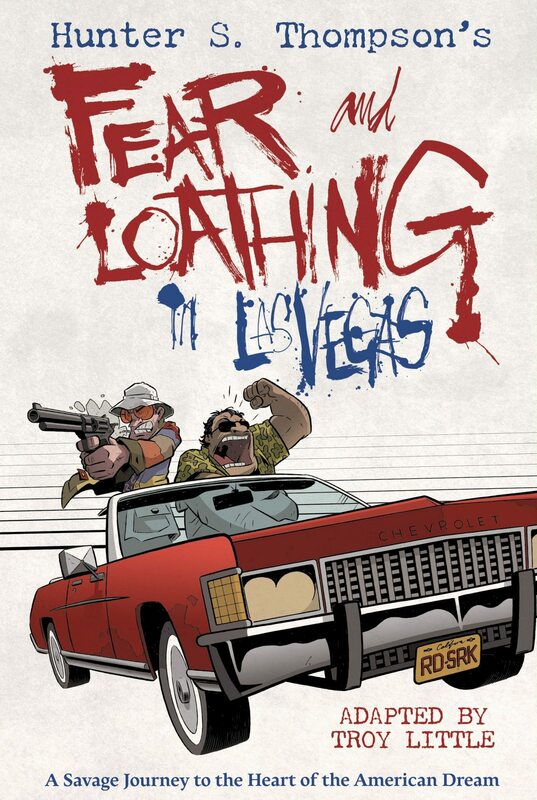 With those existing visuals, and at our current remove from 1960s drug culture, what possible purpose could a graphic novel version of Fear and Loathing in Las Vegas serve? Canadian cartoonist Troy Little is the perfect candidate to answer this question. His previous work, like Angora Napkin and Chiaroscuro, revealed his own gonzo side, while also exploring his taste for noir. Combined with his experiences as an animator, these talents make him perfectly comfortable with the elastic expressions required to recreate the exploits of Thompson and his companion, Dr. Gonzo, as they slingshot between mania, paranoia, rage, and despair. While Little’s visual interpretation is most fun during moments of crazed psychedelia, he is equally capable of conveying the quiet elements from Thompson’s text. Perhaps unsurprisingly, the graphic-novel aspect adds layers to Thompson’s prose. Little breaks each chapter into expertly paced panels and captions, allowing the reader to drink in their effect like so much acid-spiked punch. The visual action is calibrated to convey each character’s tightly wound attempts to maintain sobriety or their capitulation to full-blown freak-outs. Little reinforces his images by way of the lettering: Raoul Duke’s narration is rendered in Courier, to resemble copy coming directly off a typewriter, while loopy cadences of dialogue are presented in typographically idiosyncratic word balloons. But the real question remains: why do we need this particular book rendered as a graphic novel? There’s a possibility that the work might slip into libraries more easily in this digestible format than the original prose: not only are Little’s comic renderings more accessible than Thompson’s gonzo journalism, there is something slightly less psychotic in this interpretation than what is to be found in Steadman’s dripping pen or Depp’s sub-vocal impersonation. Thompson was already past his prime when I first encountered Fear and Loathing in Las Vegas more than 20 years ago, but I was lit up by it. No one better captures a sense of desperation in the face of inescapable odds, no one better nails that sense of rage against the pigs and squares and government assholes, or the sheer loathing for the hellscape of consumerism and broken dreams epitomized by Las Vegas in the late ’60s. Considering the mess we currently find ourselves in, Thompson’s message is more urgent than ever. His typewriter was on fire. Our world is lessened by his passing. Little’s homage is a signal to anyone who reads it, a flare that says: get with it, man! Buy the ticket; take the ride.